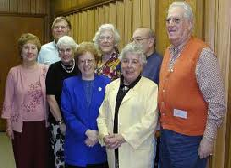 The mission of the Rhode Island Alliance for Retired Americans (RI ARA) is to ensure social and economic justice and full civil rights for all citizens so that they may enjoy lives of dignity, personal and family fulfillment and security. The RI ARA believes that all older and retired persons have a responsibility to strive to create a society that incorporates these goals and rights and that retirement provides them with opportunities to pursue new and expanded activities with their unions, civic organizations and their communities. A primary objective of the RI ARA is to enroll and mobilize retired union members and other senior and community activists into a nationwide grassroots movement advocating a progressive political and social agenda-one that respects work and strengthens families. The long-term goal of the RI ARA is to become the voice for all older Americans. By engaging in important political battles to protect and preserve programs vital to the health and economic security of older Americans, the Alliance for Retired Americans will gain recognition as the country's leading progressive grassroots senior organization. If you are a labor retiree, your national union probably pays into the national Alliance for Retired Americans. If so, you are a member of the RI ARA. If you are not a labor retiree and would like to join the RI ARA, click here and fill out the registration form. Union Benefits Plus. Log onto www.unionplus.org. Vision Care Program with no premium through Davis Vision. Dental Care Program. Discounts of 30-40% off usual & customary fees, with no premium. Hearing Aid Discount Program with Ocean State Hearing. Participation in the HealthLink Wellness Program at no cost to you. registration form. We will then issue you a HealthLink Wellness ID number. We hope this information will help seniors live healthier, happy lives while saving members money. Rhode Island Alliance for Retired Americans, Inc.
New England Association of Labor Retirees, Inc.